Abraham Louis DeMoss, of noble Huguenot ancestry and a Revolutionary War Captain from North Carolina moved to this area in the late 1700s. 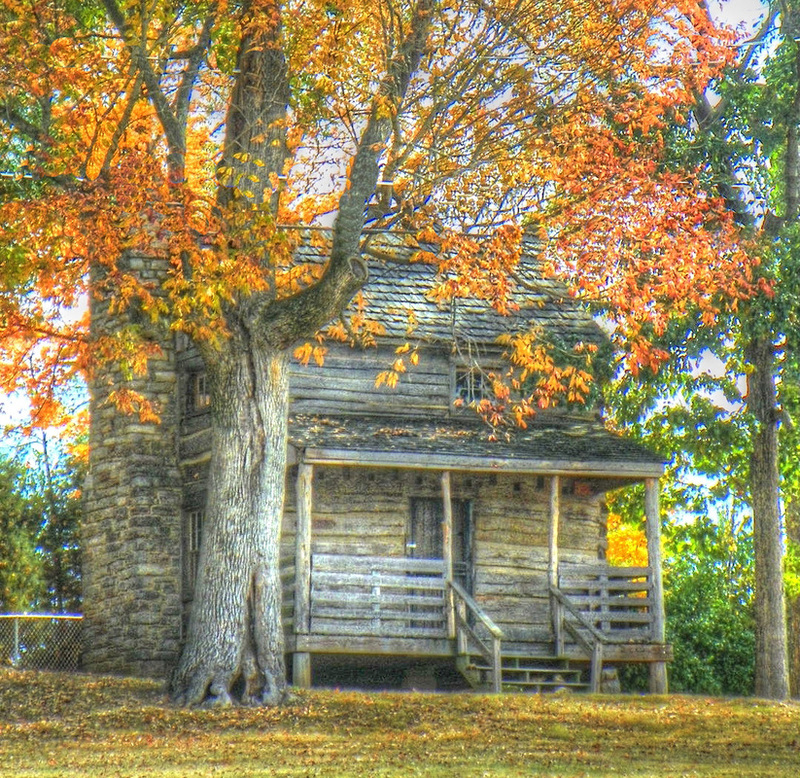 On July 28, 1800 he purchased 150 acres of land overlooking the Harpeth River where he had built his log cabin on a knoll overlooking the river, (just off Morton Mill Road). He called it Belle Vue, French for Beautiful View. His wife and nine children occupied the cabin with him. He built a sawmill, a grist mill, and a blacksmith shop, the beginnings of the thriving community that eventually took its name from his cabin. After several generations the cabin fell into a state of disrepair. Wanting to preserve the history of the cabin, descendants of Louis DeMoss, through Frank Carter, his wife, Dolores Hutchison Carter and children donated the cabin to the Bellevue Harpeth Historic Association. The cabin was dismantled, all pieces labeled, and reassembled at the location at Red Caboose Park. Riverside was built by James Skelton DeMoss, child of Abraham who "was killed in the dining room (of Riverside) by a former DeMoss slave just after the end of the Civil War." It was built near the original Belle Vue cabin overlooking the river. The original portions of the house were the dining room, upstairs bedrooms, and what became the kitchen. The newer portions of hte house were built by Dr. William J. Carter for his wife, Nancy Amonica ("Nannie" DeMoss, the youngest daughter of Abraham DeMoss, son of Abraham DeMoss who built Belle Vue) and sister of James Skelton. Nannie married William J. Carter on May 9, 1850 when he was forty-two and she was twenty-two. He constructed the newer portions around the original part of Riverside just before the Civil War. wife and without her, there would not have been any DeMoss. Note the old cemetery with her Greer siblings and Demoss are buried. Greers and Demoss intertwined with each other through marriage. Deborah Greer Quigley, Benjamin F. Greer, William F. C. Greer, Jr., William F. C. Greer Sr., Walter Talley Greer Sr.